Stickhandling is very important in hockey, many young players may think they know how to stickhandle, but you may be surprised what you are doing wrong! When most players practice stickhandling they practice with the puck in front of them and moving the puck back and forth. 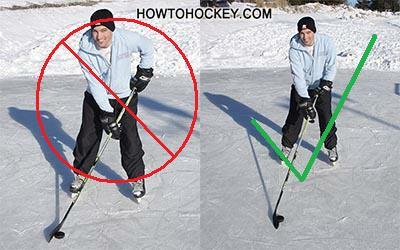 For beginning players this is fine, you need to get a feel for the puck, and practice stickhandling with your head up. But when you get older, or better at hockey you should practice a lot more. When you first start stickhandling practice moving the puck back and forth. Lift your head and just feel the puck, see what it feels like on your forehand, on your backhand, near the toe of the blade, near the heel of your blade. Get to know these feelings, by registering those feelings in your brain you will improve a lot at keeping your head up and not losing the puck as much. But there is more to stickhandling than moving the puck back and forth…. Many players think that stickhandling is moving the puck back and forth, this is wrong. When you practice stickhandling you should practice controlling the puck every where you can reach with your hockey stick. This means moving the puck side to side AND forwards and backwards, in front of you, on both sides of you, and even behind you. Practice this as soon as you can and as often as you can. Not only will you be able to stickhandle through heavy traffic, and around a lot more players, you will also be able to recover the puck more often when it is knocked off of your stick, and you will also be able to receive more passes. If you can control the puck around your entire body you will not have to slow down and wait for a pass, you will be able to reach back, tap the puck forwards and take off. Stickhandling around your entire body will give you a huge advantage over other players who only practice stickhandling in front of them, and you will be able to stickhandle around a lot more players. This is very important in stickhandling. A lot of players keep their top hand (the hand on the top of the stick) by their side, this is very restricting and gives you a limited range of motion when stickhandling. The proper way to hold the stick is with your top hand in front of you, this allows you to move your stick (and the puck) all the way around your body. 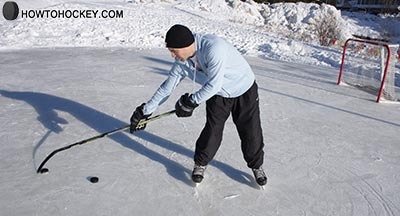 Practice moving the puck as far as you can to the right, and then bringing it back, and then moving it as far as you can to the left and then bringing it back. For even more reach practice let go of the stick with your bottom hand when you are reaching to your backhand side. The toe drag is such a powerful move in hockey, you would be crazy not to master it. How often have you seen NHL players embarrass NHL defensemen with a ridiculous toe drag? It happens quite a bit, I have attached a video of a nice toe drag by Michael Ryder . This is a good general rule, by moving the puck you are always prepared to make a deke or move on the opponent, and the opponent will always be thinking about what you are going to do next. Moving the puck is also known as dribling (moving the puck back and forth quickly) There are dekes that require you to keep the puck stationairy (like the bait and switch, will add article soon) but for the most part you should always be moving the puck. For more on this check out my deke of the week videos – A good way to beat most defensemen is to beat them with speed. Instead of skating up to them, or waiting for them to come to you and then deking them, just blow past them with your speed. When skating around the opposing players puck location is very important. Many players will skate with the puck in front of them all the time. To get an advantage over the opponent you should position the puck on the side furthest from the opposing player while stickhandling. This means if the opposing players are on the right side, move the puck to your left side and skate around them. Another way to deceive the defense is to make them think that they can get the puck from you. For example, say the defense is in front of you and on the right hand side. If I move the puck to the left side to soon then the better defencemen will move with the puck and stop me. Sometimes I will stickhandle with the puck so it appears the defencemen will easily be able to get it off of me (if the defence is on the right side, I stickhandle on the right side). I skate full tilt towards them, so they think all they have to do is knock the puck off my stick. I then quickly move the puck as far to the left side as I can, while turning, or crossing over to the left side, this gives me about a 15-20 foot difference between where the puck was, to where it currently is, and lots of room to skate around the defence. Well those are all of my stickhandling tips for now. If you have any tips of your own that you would like to add feel free to add them in the comment section below. Hi Jeremy great article, I had my son who is 12 read it, I was wondering do u hold your stick tight and hard. He’s really weak on his stick, I’m thinking its a mindset. Could also be maturity (hasn’t hit puberty) but kids smaller than him seem to be stronger on there sticks. hey Jeremy i have practised a lot on my roll up shooting pad and i can stick handle just fine when moving the puck at a moderate speed but the puck rolls up on me when i try to do fast dribbling. keeping in mind that i cup the puck is this a fault of the shooting pad that doesnt allow me to stickhandle fast? That’s normal if you have quick hands and use a regular puck. For fast moves I like to use the Green Biscuit on the shooting pad. All the way to the edge, I tried pinky over the top but didn’t really see any advantage. Jeremy what muscles are involved in stick handling and can you give me some off ice exercises to make me a better stick handler? thanks. what fake is better on a breakaway? From forehand to backhand or from backhand to forehand? The answer is relative to you as a player. I would recommend using whichever one you are the best at, but one may be better than the other depending what way you shoot and how you are approaching the goalie. Hey Jermy, should i use my top hand for shots too? it’s good news for new plyer ! on a Defender or Goalie!! Jeremy, where did you get that tube for the lower hand? Great tips as always Jeremy. I’m curious, for a Forward, you use a very long stick. Obviously it doesn’t impact your stick handling or shooting, but for less skilled players, it does. I know it’s all personal preference. I’m just wondering what are your reasons for using a long stick. I use a fairly short stick and yeah it does make it harder to receive passes not on the mark. I also have no reach on D end. I do like it for stick handling, quick shots and the control I have on passing and shooting. Over time, I’ve added an inch or 2 back. They’re still short, but I think I’m finding my comfort zone. Hey Ryan, I don’t really consider my stick that long. Off ice it might look longer, but on the ice it sits under my chin. I did try a shorter stick this year and didn’t like it at all. I like the stick a bit longer for more reach, getting passes and intercepting passes, it’s also good for getting the puck off other players. The real advantage of a short stick is that you can control the puck close to your body, but I usually just choke up a bit on the stick when I need to bring it in close. I’m not too old, but these tips and tricks are cool fun to show off and easy. really clearly explained thanks alot. Good tips. Here’s another. Too many players stickhandle the puck in front of them as they approach the goalie from straight on, or a slight angle. They have to move the puck to their forehand when ready to shoot and this movement tips off the goalie. Instead, learn how to stickhandle on the stick side on the approach to the net so that a quick shot can be snapped off at any moment without tipping off the goalie. Thank you! I have that same problem I never knew til now! Read your article, pretty good tips, I for one have mastered the toe drag…I find when I stick handle I keep the puck always close to me, I’m 6’2 and my stick is about 5’2… That way puck is always near me and I gaurd it with my feet a lot…seems to work for me.